The The OT-2 is similar to our previous tuner, the OH-17+, but has a new multi-color display. Multi-color LCD displays are the latest advance in tuner technology. It’s easy to use. Just clip it to the headstock of your instrument. The tuner senses the string vibration and displays the note and string number. The LCD display changes colors when each string is in tune. Multi-color background: flat (yellow), sharp (red) and in tune (blue). 430 to 450 Hz tuning. 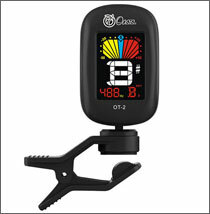 Purchase an Oasis® OT-2 Clip-On Tuner from Oasis® today.